Sometimes It Is Lupus: Health Writer's Month: LUPUS BITES! Today's Health Writer's Month topic is: Health tagline. Give yourself, your blog, your condition, or some aspect of your health a tagline. Make sure it’s catchy! If you've been reading Sometimes, It Is Lupus through the week, you already know my tagline. You've seen it written on my mascot. Yep, my tagline sums up just what I feel about lupus in two words: LUPUS BITES! This goes back to the history of where lupus got its name - people thought one of the rashes often involved in lupus looked like a wolf bite. But it's also what lupus is like to live with. It's savage and painful. It totally bites. 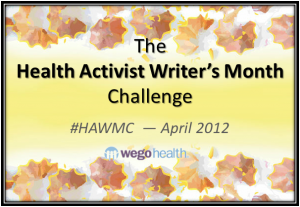 Post written as part of Wego Health's Health Activist Writer's Month Challenge. If you like my Lupus Bites wolf - he's available on shirts, mugs, etc, from irisshirtshop.toctopus.com.